In Year 7, girls participate in expressive activities such as improvisation and confidence building, and learn basic stagecraft skills to encourage them to express themselves in a supportive and fun environment and work cohesively as an ensemble. In Year 8, basics in stagecraft skills are further developed and students are introduced to play-building activities. They create characterisations, explore themes and relationships and explore texts that culminate in performances. In Year 9, students are encouraged to explore social theatre and devise a group piece for performance. They also explore different styles of theatre and experiment with these as dramaturges, directors, playwrights and performers. Students also explore the improvisational comedy of Commedia Dell Arte and learn to use and perform in mask. This year, the whole Year 9 group took part in the National Shakespeare Schools Festival, culminating in a performance at nearby Woodville Halls Theatre. You can read more here. 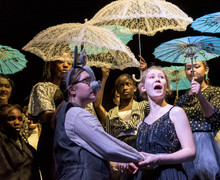 The girls' performance of an abridged version of 'A Midsummer Night's Dream' was described as "a vibrant, bold ensemble driven ‘Dream’, from a slick, focused and highly dedicated cast." Read the full feedback of their fantastic performance. All Year 7, 8 and 9 students go to see live theatre and learn to appraise and review it in a written context. As part of the AQA GCSE Drama course, students in Years 10 and 11 develop core practical performance skills, together with communication skills. The course requires the students to be active participants in workshops and public performances to showcase their developing artistry. They devise a group piece as well as work on naturalistic and non-naturalistic texts. Students watch live performances and participate in workshops through which they develop their descriptive, reflective, analytical and evaluative skills in written form. Drama and Theatre Studies is an engaging A Level which develops creativity, research skills and a theoretical understanding of Theatre. At Cobham Hall we follow the AQA specification which has a practical focus, interesting examinations and the necessary skills for future progression. Throughout the two year course, students develop an acute ability to analyse text and performance in both verbal and written contexts; explore and evaluate a range of play-texts; engage with theatre in context and have the opportunity to produce creative and imaginative practical work.